Development proposed in the Development Plan will be accompanied by measures to mitigate stormwater impacts (quantity and quality) during construction and resulting from the development. The following describes a range of “Best Management Practices” that will be used on the campus for stormwater mitigation. The mitigation measures that are associated with each specific project will be submitted with the Site Development Permit Application along with a certification from a North Carolina registered professional engineer with stormwater expertise that indicates how the measures will meet or exceed the Performance Standards. These measures will be installed coincident or prior to the Site Development Permit activities. Each Site Development Plan for buildings in the approved Development Plan shall conform to the attached Stormwater Management Performance Standards as approved by the Chapel Hill Town Council on July 2, 2001. The University is committed to a development plan that prevents any increase in the amount of stormwater runoff volume leaving the campus, the rate at which runoff leaves the campus, or the pollutant load conveyed in that runoff. In order to achieve these standards, the University first needed to understand the current campus conditions. These conditions were then compared to the future anticipated conditions under the Development Plan. The first step in planning for stormwater management involved a detailed analysis of the current drainage conditions on campus (i.e., direction of runoff and amount of runoff generated under different storm event conditions based on the existing development). This then served as the basis for comparing the impacts of the proposed development. The older, northern portion of campus drains to the north and northwest into Bolin Creek. This is a small drainage basin area of approximately 20.2 acres that primarily includes campus areas along Franklin Street. The northeast portion of campus drains to the northeast into Battle Creek and includes approximately 133.6 acres of UNC property. The eastern portion of the campus includes 76.9 acres that drains to Chapel Creek. The largest portion of the campus, approximately 550.1 acres in the central and southern region, drains westward to Meeting of the Waters Creek. The southern portion of the main campus, which primarily includes the hospital and medical school area, includes 57.6 acres that drain south to Morgan Creek. These drainage basin areas and streams are indicated on Map 6, Existing Conditions Impervious Surface Analysis, by the notations given above. Because Meeting of the Waters is such a large drainage basin, it was subdivided into eight smaller sub-basins to more accurately understand the conditions on campus. Similarly, Chapel Creek and Morgan Creek are divided into sub-basins, although only the first sub-basin of Morgan Creek (MO-1) is located on the main campus of UNC. In each of these drainage basins and sub-basins, the amount of development and specifically the amount of impervious surface (roofs, roads, parking areas) affects how the basin responds during a storm event and how much stormwater runoff is generated. A detailed Geographic Information System, or GIS, was developed for the existing campus that could accurately represent and measure the existing campus conditions. That is, the GIS can provide a detailed measurement of how much of the campus is currently paved, how much is in woodlands, how much is in lawn, etc. This GIS provides the ability to very accurately access campus conditions. The amount of impervious area is a critical measurement in that it provides an estimate of the hydro logic response of a sub-basin during a storm event. As impervious areas increase, the amount of runoff generated during a storm event increases. Not only does the rate of stormwater runoff increase, but the total volume of stormwater runoff also increases as rainfall is no longer able to soak into the soil mantle, but instead runs off the land surface. The data for the Existing Conditions Impervious Surface Analysis are presented in Table 1. For each Sub-basin, the total area of UNC campus property is indicated in acres. This is not necessarily the entire drainage area, but only the area that is UNC property (that is, the stream may receive drainage from properties that are not part of UNC but only UNC properties are considered in this analysis). The amount of this area that is impervious is indicated, as well as the amount of area that is currently pervious, which is either woodland areas or lawns and maintained areas. This information is also indicated graphically on Map 6, with buildings shown in black, pavement areas in gray, and pervious areas shown in green. The term “existing conditions” is somewhat misleading in that the base maps used to develop the GIS are based on 1998 data. Therefore the Existing Conditions Impervious Surface data presented in Table 1 is actually a snapshot of conditions in 1998, and does not include a number of development activities that have been built or approved between 1998 and 2001. The changes in impervious surface from these more recent projects are represented in the Development Plan Analysis. This is a conservative approach in that the stormwater impacts from these more recent projects are addressed as though these projects were part of the current Development Plan, rather than existing or approved projects. In other words, the Development Plan analysis overestimates the impacts of future development by including these more recent projects. In order to evaluate the stormwater impact of the Development Plan, the location and dimensions of the projects proposed under this Plan were incorporated into the GIS. These projects and their locations are indicated on Map 7, Development Plan Impervious Surface Analysis. Similar to Map 6, the buildings are indicated in black and pavement areas in gray, and the new development projects are indicated red. As can be seen from Map 7, a number of these projects are located in areas that are currently impervious. The Impervious Surface Analysis associated with Map 7 is provided in Table 2. For each drainage sub-basin, the land use was carefully evaluated using the GIS to determine the changes in land use. This data is provided in Table 2, which presents the estimate of the sub-basin area that is UNC property, as well as the number of acres that will be impervious and the number of areas that will be pervious under the proposed Development Plan. A comparison of Tables 1 and 2 shows that certain sub-basins experience little or no change in the amounts of pervious and impervious areas ( namely the Battle Creek, Bolin Creek, and Chapel Creek sub-basins, as well as Meeting of the Waters sub-areas ME-3, ME-4, and ME-6). At the same time, in certain sub-basins (ME-2 and ME-8) the Development Plan will decrease or remove impervious areas and increase pervious areas. Other sub-basins (ME-1, ME-5, ME-7, and MO-I) will experience much of the proposed development and an increase in impervious areas, with a corresponding increase in the conditions conducive to stormwater runoff during storm events. Overall, the campus increase in impervious area under the Development Plan is approximately three acres, from 258 acres of impervious area to 261 acres of impervious area (or an increase of approximately 1.1 %). Carefully scrutiny of Tables 1 and 2 will reveal that there is some “noise” in the data (i.e., Table 1 indicates 839 acres of campus area and Table 2 indicates 837 acres of campus area, a difference of approximately 0.2% ). This is because there is some error in the mapping process that cannot be avoided, however the use of GIS techniques to estimate the changes in land use represents the best available technology, and the error is considered negligible. *The drainage basin analysis includes all UNC main campus property, including areas that are not part of the OI-4 zoning. Using the GIS and the data in Tables 1 and 2, the impacts of the proposed development on stormwater runoff were carefully evaluated using the USDA Soil Conservation Service “Cover Complex Method”. This method uses data regarding soil conditions and land use cover (and impervious area) to estimate the hydro logic response of a sub-basin during specific rainfall storm events. This is the most widely accepted engineering method of evaluating stormwater impacts, and this evaluation was done in accordance with the Stormwater Management Performance Standards adopted by the Chapel Hill Town Council on July 2, 2001. For each drainage sub-basin, the net increase or decrease in the total volume of stormwater runoff before and after development was estimated using the Cover Complex Method. This data is presented in Table 3. Table 3 shows that absent the employment of storm water mitigation techniques there would be a slight increase in the total volume of runoff from the main campus as a result of the Development Plan. This increase would be approximately 0.89 acre-feet for a 2-year storm event of 3.6 inches of rainfall, and approximately 1.14 acre-feet for a 100-year storm event of 8.0 inches of rainfall. *The drainage basin analysis includes all UNC main campus property, including areas that are not part of the O1-4 zoning. Without mitigation, although the overall potential campus increase in stormwater impacts is small, in certain areas the potential impact of development is more significant. For example the increase stormwater runoff in the Morgan Creek sub-basin would be greater than the overall campus impact because this area will experience more development under the proposed plan. For this reason, the University stormwater management approach will be implemented on a drainage basin basis rather than on a net campus basis. That is, for each location where stormwater discharges from the campus property, the standards of no net increase in storm water volume, runoff rate, or pollutant load will be applied at that location. To the extent possible, specific measures will be incorporated within each development project, but in certain instances this may not be feasible. In these situations, measures will be implemented elsewhere on campus in the same drainage basin so that the effects of development are mitigated at the location where the stormwater discharges from the University property, and there is no increase in volume, rate, or pollutant load discharging from University property. Special attention will be taken for residential neighborhoods in the Perimeter Transition Areas on the southern boundary, especially with regards to stormwater impacts and erosion and sediment control measures during construction. It should be noted that the Egan and Wolfenden properties do not receive drainage from the campus, but instead are part of the drainage that the campus receives. The northwest corner of the Steele property currently receives drainage from an area that includes a small portion of the UNC campus. In this area, specific care with regards to erosion and sediment control measures will be implemented during construction periods. Permanent stormwater control measures will be implemented to insure that there is no increase in storm water runoff ( volume or rate) discharged to this area. No increase in the volume of runoff leaving main campus for all future development projects. No increase in the rate of runoff or the quantity of non-point source pollutants as a result of new development. An overall decrease in the volume of stormwater runoff, the rate of runoff, and the amount of non-point source pollutants leaving campus as compared to existing conditions. To achieve these goals, the University will incorporate innovative and site-specific stormwater management approaches and technologies to prevent any further impact from development, and to lessen the impact of the existing campus development. There are several factors that are influencing this approach to campus stormwater management, including the guidelines of the Campus Environmental Master Plan, which seeks to protect and preserve the unique beauty and the environmental features of the campus. Additionally, there is a need to develop the campus in such a way as to prevent negative impacts to the campus neighbors and adjoining downstream communities. And finally, in anticipation of the upcoming NPDES Phase II permitting requirements, there is a need to improve the existing stormwater management on campus. As part of the eight-year development plan, each new development project will be evaluated to identify opportunities to incorporate better stormwater management practices within the scope of the project. These practices are focused on holding (retaining) stormwater and infiltrating or evapotranspirating runoff, as well as reducing the generation of runoff and pollutants. The goal is that new projects will not add to the current stormwater burden, and to the extent possible, will mitigate for existing conditions. Practices that will be considered include stormwater storage and infiltration methods such as porous paving parking areas, storage/infiltration beds beneath parking, playfield and lawn areas, restoration of stream corridors, changes in landscape practices, protection and restoration of environmentally sensitive areas, vegetated roofs, and other methods. This approach represents a significant and positive change in the development process on campus. In addition to near-future development projects, the University is also undertaking a Campus Stormwater Management Project that will further define stormwater management practices and methods, and will evaluate critical areas for mitigation. This project will quantify stormwater issues on campus and will recommend specific projects or programs to be implemented to improve stormwater conditions on campus. It is anticipated that these will include non-structural approaches, such as changes in landscape management practices, as well as specific structural measures to be implemented to mitigate for the existing campus conditions. Finally, much of the existing stream network on campus has been buried and placed in pipes over the years. This has a significant and detrimental effect on stream water quality. Consistent with the Environmental Master Plan, the stormwater program will seek to daylight these streams to the extent possible, to restore oxygen and sunlight, and to reconnect the campus to the natural system. Examples of these systems and other similar methods are included in Attachment A.
Additionally, area constraints will sometimes require that stormwater be retained at a building facility. 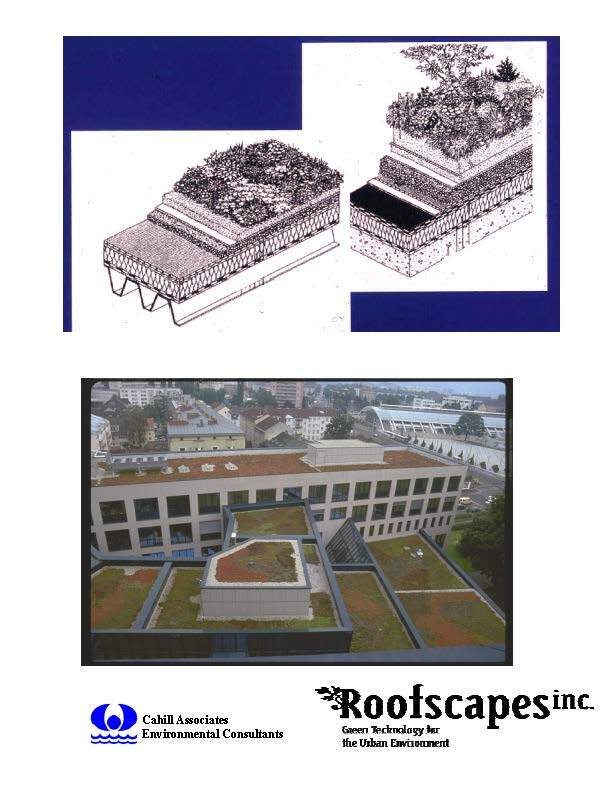 In such situations, the use of vegetated roof systems to retain and evapotranspirate the rainfall that falls directly onto the building surface will be considered. Examples of these systems are also included in Attachment A. It is anticipated that existing campus areas will require retrofitting for improved stormwater management, and that these areas may not be associated with a specific development project. These will be addressed with the stormwater management project that the University is currently undertaking. In addition to new design projects, this project will also look for opportunities for better stormwater management throughout campus. The methods employed will address not just stormwater discharge rates but also to reduce the volume of stormwater runoff as well as the associated non-point source pollutants. The University has received funding under the Higher Education Bond for a capital improvement project that will address stormwater management on a campus-wide basis. New strategies for the existing and proposed development at UNC-Chapel Hill are required to restore and sustain the hydrologic balance of the local drainage basins. These strategies include protection and re-­establishment of areas critical to the hydro logic cycle and approaches to stormwater design that increase aquifer recharge and promote water quality. The project will include an inventory of the existing infrastructure, design of a campus stormwater management system, identification of specific projects for implementation, coordination with Town and State officials, phasing plan for implementation, pilot testing of various innovative and creative stormwater management technologies, and finally phased implementation of the system. Three types of stream monitoring will be conducted on streams that may be impacted by main campus post-construction stormwater runoff. The first type is hourly monitoring at a remotely operated gauging station on Meeting of the Waters Creek within the North Carolina Botanical Gardens. A stream/rain gauge was installed at the Meeting of the Waters outfall in May 2001 and is currently collecting data. The station takes hourly measurements of stream flow and precipitation data, along with physical and chemical parameters including temperature, pH, conductivity, turbidity and dissolved oxygen. Stream data from the gauging station are downloaded once per day for storage on a computer. The data are reviewed for trends that may indicate increases or decreases in water quality. This gauging station will be important in determining the effectiveness of stormwater mitigation measures on the main campus. Visual outfall monitoring on a quarterly basis will also occur at this location. These visual inspections will look for signs of scour, sedimentation, and debris buildup. Visual outfall monitoring on a quarterly basis will occur at a tributary to Morgan Creek near the South Chiller Plant, at Battle Branch, and at outfalls leading to Bolin Creek along the northern O1-4 tract boundary and Franklin Street. These visual inspections will look for signs of scour, sedimentation, and debris buildup. Quantitative benthic macro invertebrate sampling with a Surber stream sampler will be conducted semiannually (summer and winter) at various points along Meeting of the Waters Creek. The benthic samples will be examined for both the diversity and numbers of organisms. Because stream-bottom macro invertebrates vary in their sensitivity to pollutants, they are good indicators of recent trends in water quality. Some of these organisms are tolerant to pollution while some are very sensitive. Sampling the macro invertebrates gives a good indication of what the water quality has been for the past few months leading up to the sampling event. Stream monitoring sites are indicated on Map 6, “Existing Conditions Impervious Surface Analysis”. Construction of all buildings in the Development Plan will comply with the NC State Regulations for erosion and sediment control. Details of erosion and sediment control measures for individual projects in the approved Development Plan will be submitted with the Site Development Permit Application for that site. 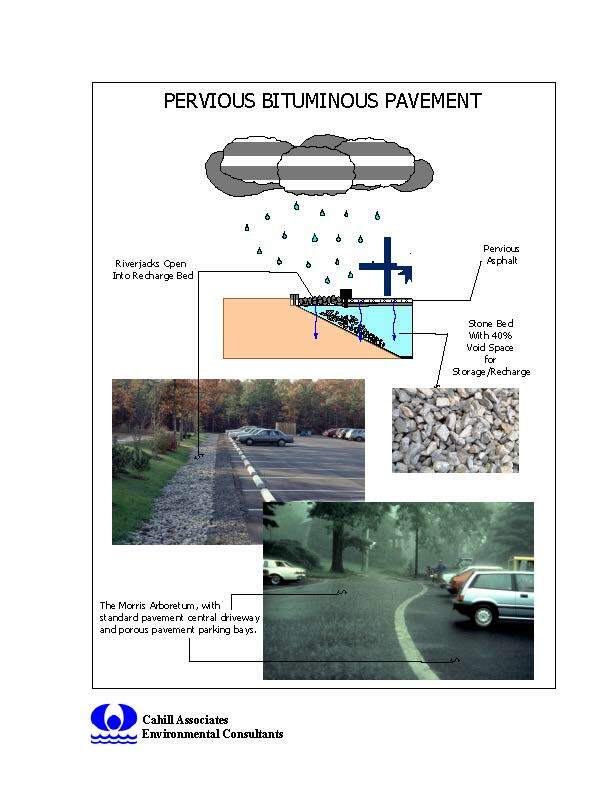 Porous Bituminous Pavement is standard asphalt in which the fines have been held to a minimum, allowing water to pass through the pavement. Beneath the pavement is a uniformly graded, clean stone bed of sufficient depth to catch and store the water as it drains through the pavement. The bottom of the stone bed is underlain with filter fabric on uncompacted soils, which allows the runoff to infiltrate into the soil. This reduces the volume of runoff and replenishes the groundwater table and stream baseflow. A similar approach can be used with standard asphalt if the water is conveyed to a stone bed beneath the paving. Porous pavement systems have been operating successfully for twenty years, and are a viable technology when properly designed and constructed. 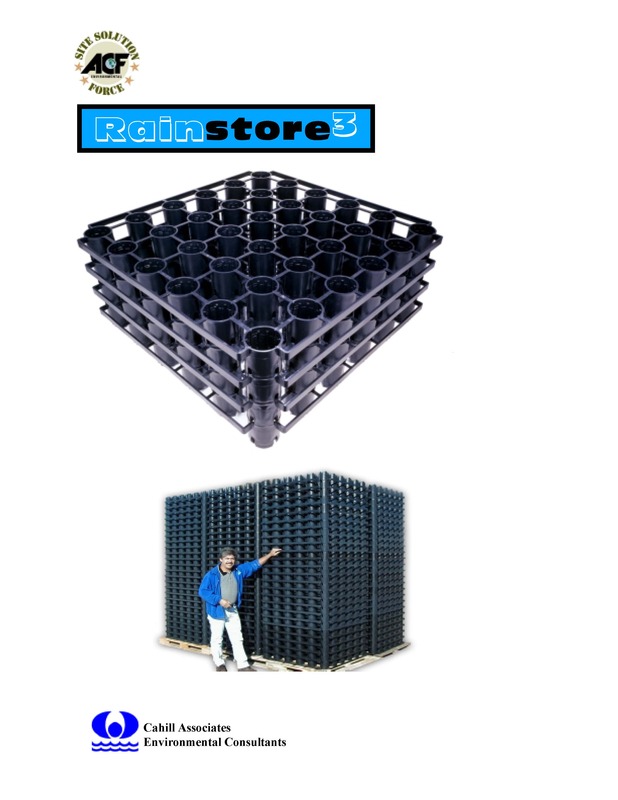 Rainstore3 is a specific manufactured product that allows the storage and infiltration of stormwater beneath parking lots, playfields, etc. Because it provides 94% void space and is structurally capable of handling truck loads, it provides a substantial opportunity for stormwater management in a limited area. This system is currently proposed for the reconstruction of Ehringhaus Field. 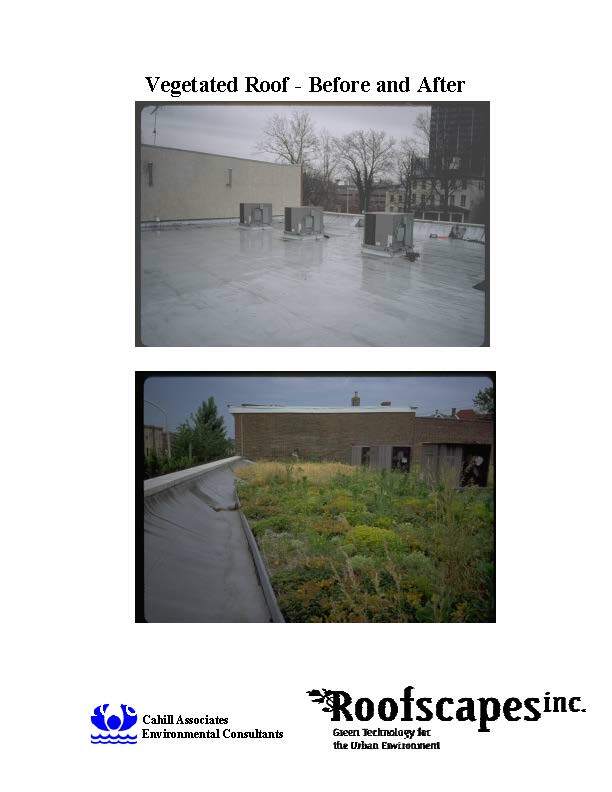 Roof areas generate significant amounts of runoff that is generally clean and sediment free. However, as this runoff runs across the land surface or in channels, it has the opportunity to scour pollutants from the land surface and to cause erosion. 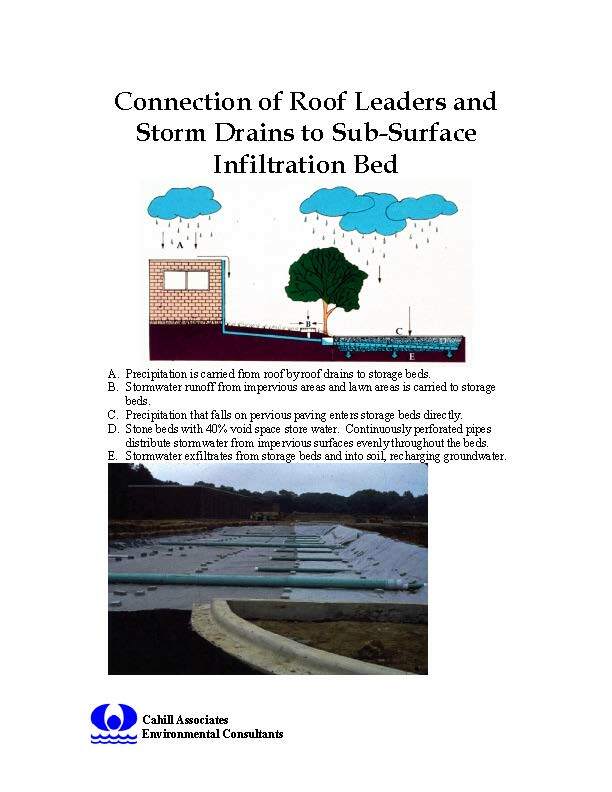 Direct connection of roof leaders to sub-surface storage/infiltration beds is a viable solution to this source of runoff. Vegetated Roof systems can hold and evaporate the first half-inch or more of runoff and evaporate the collected water via the plant community. Alternatively, systems to collect and store the water on the roof, and then use that water to irrigate roof plaza and lawn areas, can also be implemented. A system to collect the water on the roof of the new Ram’s Head Building will provide irrigation water for the lawn and trees that will be located on the plaza of the Rams Head Building. Woodland Berms provide an opportunity to intercept runoff from upstream development as it runs down the hillside. Shallow berms constructed along the contour collect and intercept the runoff, preventing erosive conditions and providing the infiltration necessary to maintain existing woodlands. 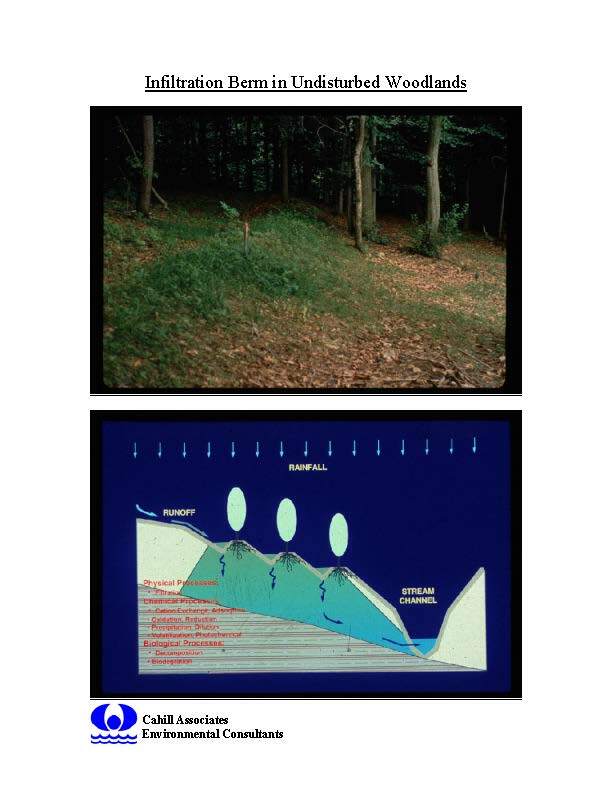 Often, existing woodlands can die off when uphill development prevents infiltration and the soil moisture is reduced. Woodland berms address this issue and reduce the runoff impacts. This measure can be implemented within existing sloped wooded areas that are to be protected. 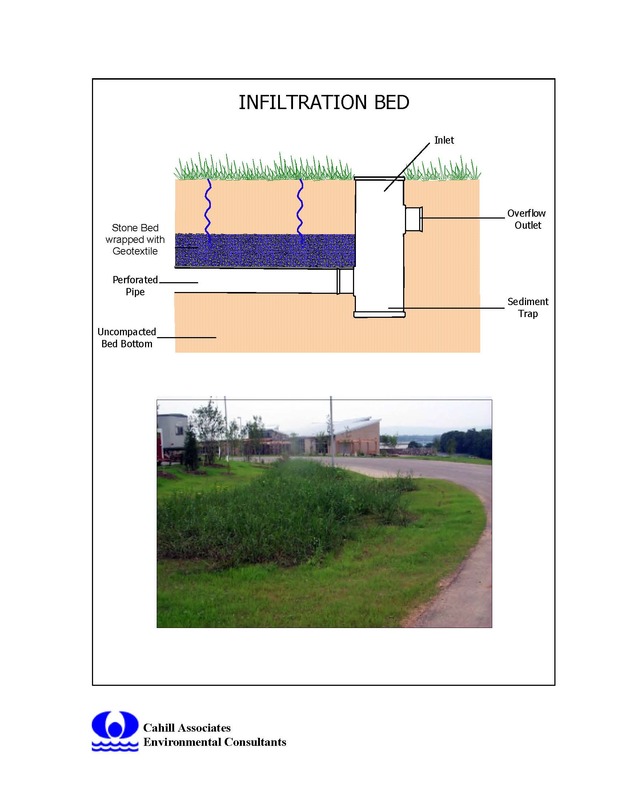 An Infiltration Bed, consisting of a stone storage/recharge bed beneath plantings, can be used within the landscape to collect and store/infiltrate runoff from existing buildings, parking areas, and roads/sidewalks. This is an inexpensive option that can be incorporated within the existing campus areas to reduce stormwater impacts. A stone storage/infiltration bed can be located beneath landscaped areas or playfields. The 18 inches of soil above the bed allows for landscaping and plantings. 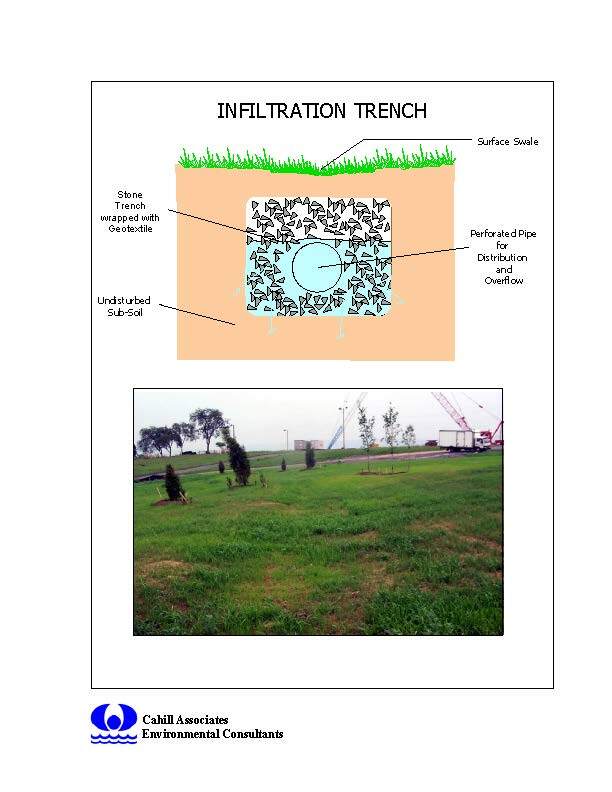 An infiltration trench is essentially a storm sewer that is designed to leak. A perforated pipe is set in a bed of stone wrapped in filter fabric, with soil and a surface swale located above the pipe. The trench should run along the contour or nearly level to allow infiltration to occur along the length of the trench. Infiltration trenches provide an opportunity to store and infiltrate runoff in areas where there is not a lot of available space, such as adjacent to roadways and parking areas, or between parking spaces. Porous Concrete is similar to porous bituminous asphalt in that the fines are held to a minimum, allowing water to pass through the concrete to a stone bed beneath. 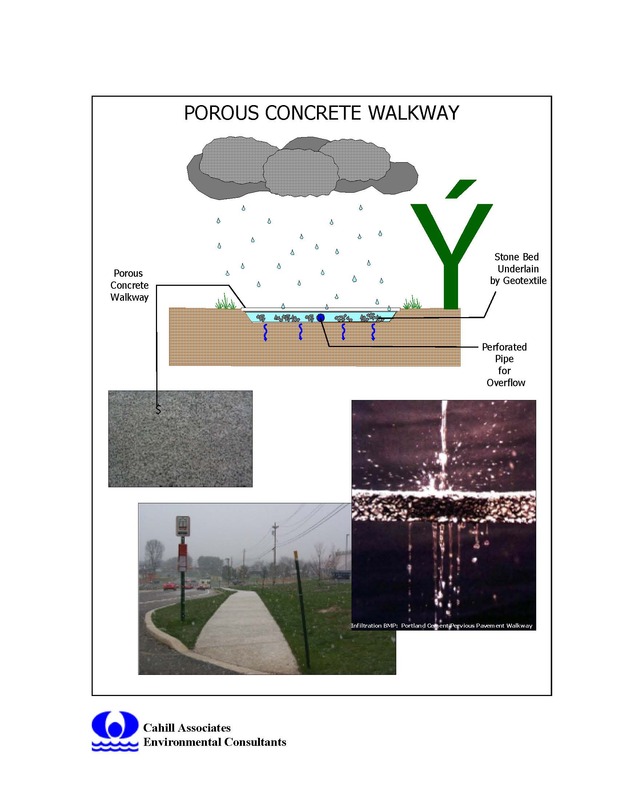 Porous concrete is ideally suited to sidewalks, provided an opportunity to store/infiltrate stormwater in areas where there is limited space available.